Wow, they definitely look challenging to make. I love seeing all the Diwali sweets people are making even though I don't really make sweets myself. Wow..they look beautiful. I loved to read the 'Jalebi' story. I was also tempted to make them many times, but then whenever I went to indian store here, I bought them and I was happy with that. In my case, I was tempted to make "ghariyo" a savory snack and I had a lot of trouble. Majha pan dokyavarla bhoot uterle :D.
Kudos for attempting a difficult recipe and it came out well too! The pics look relly good! Happy Diwali! Great! That reminds me of my first and only jalebi making about an year ago. It was very time consuming and I never thought about making it again even though I wanted to eat it! I wouldn't have even thought about a marinade injector! I just filled a ziploc bag with the batter and made a small round hole on the corner. Ooh..what a mess it was. But the end result was worth it. Kalyn, it's a virtual feast, too! I generally don't make sweets except at Ganesh Chaturthi and Diwali. Shilpa, yup! Totally done with making jalebis! What is ghariyo? Sra, it's good to be back and cooking, disasters and all! Vani, it certainly did! Happy Diwali to you, too, and welcome to IFR! Thanks for the wishes. Wish you a happy, healthy and prosperous Deepavali. Manisha - "Garma Garam" Jalebi is my favorite dessert. Dad would get them warm from a corner store for me and I would eat a LOT of it. People who have seen me are always aghast that I can eat so much jalebi in one sitting :). Anyway, I have always wanted to make them but now I am having second thoughts...:O but your jalebis do look yummy! bravo manisha! lol. it's like a lot of those really delicious pastry things ... once u try it and exorcise it out of your system, it's easier just to buy. but hey, at least now u can boast you made your own jalabi. we make these during the jewish holiday of lights [hannukah] where everything is fried in oil. so very good, so very time consuming not to mention the stench of oil in the kitchen and on your clothes. happy belated diwali. Manisha, ghariyo is a savory snack made of urad daal with skin. It is a snack which is being forgotten in recent times. No one makes them these days. I absolutely loved them so I made them for Diwali and then blogged about it. Could not see them disappear from the face of earth :D.
Yes, I know how you feel. I have this crazy obsession with making things from scratch. I tried to make rasmalai and what a disaster it was. Tried RP's baked rasmalai with ricotto and what a breeze it was. The results were delicious too. hey manisha, your jilebi's look good for a first timer. ive used gits jilebi pack and used ziplock bags and mine came out pretty decent. also im glad i finally found another food blogger from the same vicinity. i live in longmont, colorado. I am having trouble leaving comments on your site.. did you observe it before? Ha Ha! that's funny Manisha! I have also had a huge disaster with jalebis a long time ago. I used the GITS readymade mix and blech!! nowhere close to the real thing. since then, I just stick to the store bought version, although I have to admit that every once in a while, I am tempted to try again. Happy Diwali to you and yours!! When when did you find the time and courage to make these?? 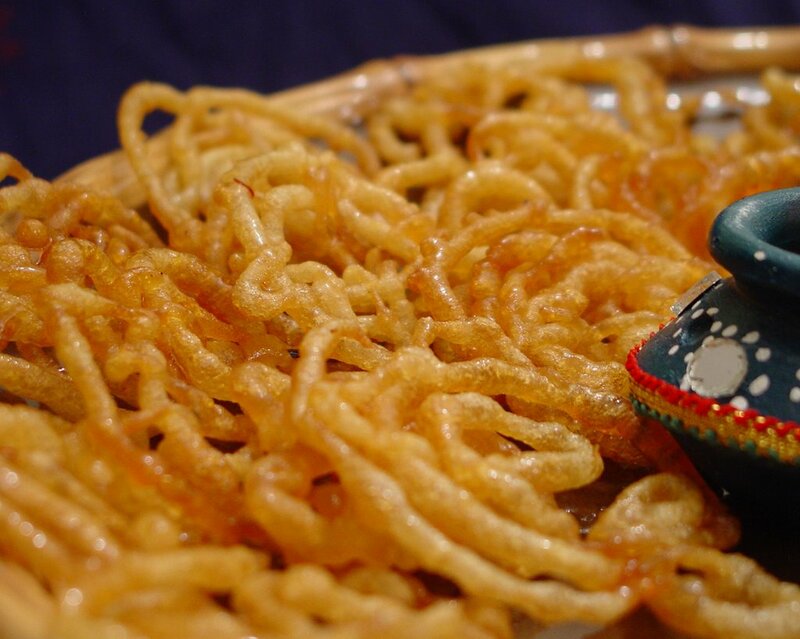 You are so right about sweets like jalebis though, taste best when made for you! Did Medha like them? In the north they are served dunked in milk, taste heavenly. Elizabeth, a ricer has too many holes. We need a device with single hole that is just the right size! Everyone I've been talking to says that they use ziploc baggies. Here is a picture of jalebis being fried. It looks like the woman is using something like a cheesecloth with a hole in it. Mythili, thanks! Diwali was fun and a lot of the celebration is going to get carried over into Hallowe'en! L2C, thanks for the wishes! Making jalebis is just not worth it according to me. Might as well eat them garam garam and enjoy them than have a disaster on your hands and end up feeling slightly nauseous from the smell of frying and the sweet smell of the syrup! BurekaBoy, you said it! About the smell! You know someone else mentioned that Diwali is to the Hindus what Hannukah is to the Jewish. A friend of mine has told me that she will let me know when she makes jalebis so that I can see what she does. She's off to India for a couple of months so I won't see her till January. More than anything, I am very curious what I did wrong or what I could have done better! I have a feeling my husband will accompany me, too, cos whenever anything flops, he's right there by my side because that's when cooking becomes a real challenge! So round two may happen but probably not in my kitchen! Shilpa, ghariyo looks and sounds good! Thank you for making sure they are not forgotten! Gini, I think I am plain lazy when it comes to these things! I've eyed RP's ras malai recipe but never was brave enough to try it. I make a no-fuss no-cook out-of-the-tin ras malai! I saw that Swad has started selling packaged ras malai. Have you tried those? Deepz, welcome to IFR! It's great to know that you're in the area! There is one Indian food blogger in my town! I haven't been able to get in touch with her yet but I hope to, soon! Maybe we can have a mini-meet?! And maybe you can show me how to make jalebis before my friend comes back from India, eh?! If you're interested, sign up for the Front Range Bloggers Meetup Group. I haven't yet been able to attend a meetup but plan to one of these months. Stay in touch! KA, we know the moosh, don't we?! About leaving comments, it must be yet another Blogger hiccup. I really should move to my own server and a better CMS. Sorry about that! But thanks for keeping at it and posting anyway! Heather, welcome! I read your post on Deepavali and it was really super! As I said on your blog, my neighbors don't know about Diwali. But they will know next year, that's for sure! What I love about the 'hood I live in is that they are very open to other cultures and always willing to share the experience - especially food! SH, I have an aversion to the ready mixes. No that I have tried any other mix besides the instant idli. Now that was a blech! It had this awful musty smell and so I have steered clear of the mixes. But the gulab jamuns that a friend had made were just fine. So maybe it was just the idlis? I don't know! Hope you had a great Diwali with your little wonders! Ashwini, kay sangu tula...I had to do it! Now it's been exorcized and I am free! Dunked in milk sounds delicious! One of my cousins told me I am not making faraal at all. Maharashtrian faraal has to be chivda, chakli, shankarpali, besanache ladu, chavde - that sort of stuff. Oh well! Diwali's done but I still have to make besanache ladu, chivda and chakli. Medha loved them! She was standing right by the plate and eating them like it was bhaji. I had to tell her to stop! Hope you had a great Diwali! Send me some right now ... please! I have always loved jalebis and when we were in Dubai last time Soeren tried his first jalebis ... he takes after his mum and I had to literally tear him away from the guy making these. It sounds so challenging to make that I think your advice to let someone else make them is a good one. Hope you got my Diwali greetings on Flickr! The Jalebi you posted look scrumptious! I was watching SBS (TV Channel) only last night, "A Food Lovers guide to Australia" and saw Jalebi being made from scratch and your photographs I must admit look much nicer (but shhhhh! ;)) Excellent Job! Kudos to you for attempting this. But they do look great...maybe you wanna try just one more time? :) That mustard bottle idea seems worth a try...? lovely jalebis.. i bet ur family had a good time devouring them.. i am too intimidated to make them.i love really hot thin jalebis so i don't wantot destroy the yummy memories. hahaha... jalebis are one of my all-time faves and I do agree that they're best made by professional halwais! :) I've made it once and it came out pretty good... but I have to say I'm not dying to make more :) I might, if the craving takes me, but as of now - not! OOOOOh my mouth is watering. My favourite childhood memories are of visiting the Akram Store in Portsmouth England with my nan to buy curry powder. "can we get Jalebis Nan?" Havent eaten them in a million years but i will have to try making these. I remember my nan telling me that her mum used to make them and they used a tin can with a hole punched in the bottom for the batter to come out and holes in the rim to thread string. Apparently this made it easy to create the shape. Hope this helps. Meeta, Soeren knows a good thing when he sees it! That's for sure! Artizen flair, wow! That's a huge compliment! I just wish I had been more successful! Anita, he bhooth uttarla but then others take its place! Will try the mustard bottle. First I need to be able to fit back into my clothes! Shaheen, let someone else make them! That's the best way! Prema, I'm more than a few months late but yes, Diwali was very good! Loo, welcome! Good luck with making them! If they are a success, please come right back and share some tips! Right now, I think I'm done - I can't bear the smell of anything being fried! Till the bug hits me again! A tin can, eh? I will try the mustard bottle and the tin can the next time.